Paper or plastic? 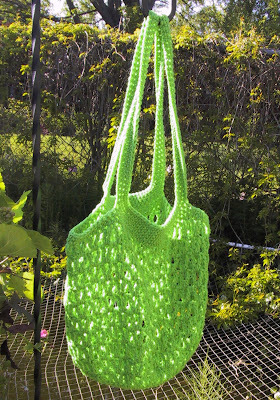 The answer is neither, GO GREEN by crocheting a reusable market bag. 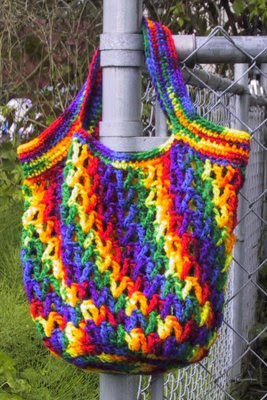 Would also make a great beach bag. What other uses can you think of? Instructions are included for over the shoulder straps, or a shorter version for over the arm. 3. When working the joining slipstitch pull the stitch tight. That way you won’t be tempted to work into it next time around. 4. If your gauge is larger than stated, 5 ounces may not be enough to finish bag. So make your first one out of a 7 ounce skein. 5. Be sure to change to the H hook for working rounds 16-21, this gives your bag a stable top. 6. 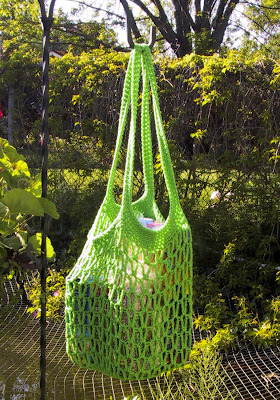 You can make the Go Green Market Bag without the CD, it will be less structured if you choose to leave it out. Worsted weight yarn, approximately 5 oz. Round 1-4: Rep rounds 1 - 4 of inside base but DO NOT fasten off. Ch 1. Round 5: Put both pieces together, wrong sides facing each other. Working through both layers; insert hook through same st as join and any st on the other layer, slipstitch. With I hook, leaving an 8 inch tail, chain the length that you need your sweater width to be, plus 2 stitches. See note 1 about sizes. Row 1F: Hdc in 3rd ch from hook, and in each ch across. Ch 2, turn. Row 2F: Hdc in each st across. Ch 2, turn. Repeat row 2 until you reach length needed for body. Find center front and place marker. Measure the width across animal’s chest just below neck. This is the width for the neckline opening. From center measure one half the width for your neck opening, mark with stitch marker on each side of center. Hdc to first marker (neck opening), ch the same number of sts as between the 2 markers. Skip the sts between the markers, hdc in remaining sts across. Ch 2, turn. 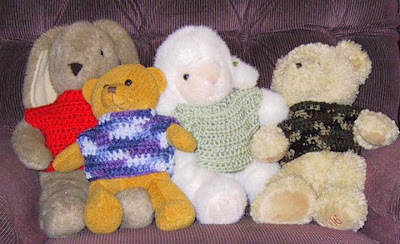 Row 1B: Hdc in each hdc and each ch. Ch 2, turn. Row 2B: Hdc in each st across. Ch 2, turn. Repeat row 2 until the back has the same number of rows as the front of the sweater. Fasten off leaving tail long enough for sewing side seam. To finish sew side seams, leaving an opening for the arms (legs). Round 1: Attach yarn in hdc at side of neck edge. *Ch 2, hdc in each st around neck, slipstitch in top of beginning hdc to join. Round 2: Ch 2, hdc in each st around, slipstitch in top of first hdc to join. Round 1: Attach yarn in hdc at side of neck edge. *Ch 2, hdc in each st around neck, slipstitch in top of first hdc to join. Round 2: Ch 2, work a bphdc around hdc, work fphdc around next hdc, repeat from * around, ending with a fphdc. Join with a bphdc around the first bphdc. If you happen to end with a bphdc don’t fret about it. You can fudge it by joining with a fphdc around the chain 2 instead of the first bphdc. Round 3: Ch 2, work a fphdc around each fphdc and a bphdc around each bphdc. Join with a slipstitch around first fphdc. 1: With worsted weight yarn and an I (5.5 mm) hook, 24 stitch chain fits a 15 inch tummy. 2: These are the length of starting chains that work for me for different sized animals.